Broken, decayed teeth can be a source of embarrassment and pain. Fortunately, porcelain crowns treatment can repair damaged teeth and prevent tooth loss. Improving oral health is just one of many benefits provided by porcelain crown treatment. 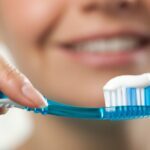 Chicago cosmetic dentist Craig Kohler offers this overview of porcelain crowns treatment to help you understand how porcelain crowns can improve your smile. Porcelain crowns are tooth-shaped dental restorations used to restore dental function and appearance. 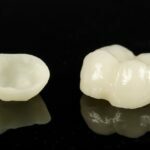 Porcelain crowns are custom-made using impressions taken of the patient’s teeth. Generally, porcelain crown treatment requires two dental visits. The first visit is needed to prepare the tooth by removing decay, and debris, then making the impression, and finally placing a temporary crown. The impression is then sent to a dental lab where the crown is crafted using durable porcelain. Once the crown is finished, a second dental appointment is made to remove the temporary crown and fit and cement the porcelain crown in place. Boosts Confidence: Porcelain crowns can mask teeth flawed by decay, metal fillings, or fractures, so when you smile and talk, you can feel confident knowing all anyone can see are beautiful looking teeth. Restores Dental Function: Broken teeth or teeth with decay can make eating painful, interfering with oral function. Dental crowns restore the structure of the teeth so you can eat pain-free. Saves Teeth: Decayed, damaged teeth run the risk of further decay and injury and, if left untreated, can lead to tooth loss. Dental crowns completely encase the teeth, preventing further damage and saving teeth from tooth loss. Improved Oral Health: Cavities can lead to major dental problems like abscesses and tooth loss. Fortunately, dental crowns are beneficial for protecting the teeth from further damage, improving overall oral health. Restored Dental Strength: Teeth with large fillings often have weakened tooth walls, making them weak and vulnerable to breaking. Dental crowns can restore the strength of such teeth. Improved Aesthetics: One of the most obvious benefits of dental crowns is an overall improvement of dental appearance. Dental Decay: Dental decay can be repaired with porcelain crown treatment. Broken Teeth: The structure and appearance of broken teeth can be restored with porcelain crowns. Teeth with Fillings: Porcelain crowns can restore appearance and provide a layer of protection to teeth with large, unsightly fillings. Misshaped Teeth: Porcelain crowns can even be used as a cosmetic dentistry treatment. The appearance of teeth that are irregularly shaped can be improved with crowns. 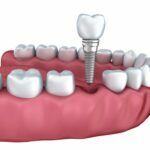 Missing Teeth: Porcelain crown restorations can be paired with dental implants to permanently replace missing teeth. To find out if porcelain crowns treatment is right for you, schedule a consultation with Dr. Kohler today!